Amnte Nofre – Newsletter n.5. The climax of the Odyssey is the hero’s arrival in Ithaca but a harbinger of that pivotal moment is his sojourn on the island of Scheria (Phaecia), which I have written about here. 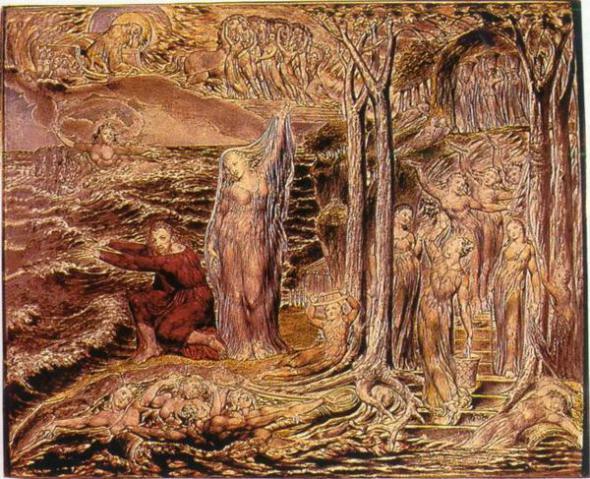 William Blake also connected these two events, i.e. arrival in Scheria and subsequent arrival in Ithaca, into a unified vision. In his painting “The Sea of Space and Time” the left side is occupied by Odysseus and goddess Leukothea, the right side presents the magical Cave of Nymphs found on Ithaca. Having rejected Calypso’s gift of immortality, Odysseus chose life in the body – incarnation. This is the theme of Blake’s painting. blown on the autumn plains, but intact still. The Secrets of the Odyssey (9): Leucothea in the Sea of Space and Time. The White Birds. So beautiful white and free.